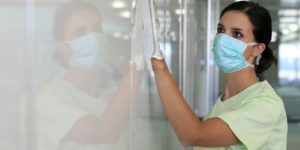 In a sector where error, omission or mishandling are unthinkable, the DOSIM Healthcare team consists of healthcare professionals and operational specialists familiar with the requirements and needs of a bio-cleaning service. Experts speaking the same language at your service: this is the essential principle for a bio-cleaning service. DOSIM has implemented proven operating protocols to guarantee patient safety, these are particularly involved in the fight against nosocomial diseases. the continuous research for business-focused innovation, whether at the technical or organisation level. The DOSIM Healthcare action is guided by the well-being that its customers patients should feel, well-being that includes the feeling of safety and is therefore part of the trust established with the patient. DOSIM’s team is driven by high standards and absolute patient comfort is its priority.